A Gray Drake “cluster”….ready for a big ‘ol trout to go “GULP” !! The Muskegon river fishing report for February 11, 2019 in the Newaygo, Michigan area is about the aftermath of the “Polar Vortex” and how it affected the river and the fishing conditions. With unprecedented cold weather having come through much of the northern United States the first week of February, we saw the rivers react accordingly and many were either locked up with shelf ice, or flowing mostly slush for a number of days. Some smaller river systems even had “anchor ice” form, which is where ice forms on the bottom of rivers or lakes, also referred to “ground ice”. When this happens, you KNOW it’s cold out ! Fish will hunker down during such extreme conditions and their bodies metabolism is low. They often go into a trance like state, using only the energy necessary to stay positioned in a river or lake. Fish don’t feed much when it’s this cold, but they do still need to feed on occasion to keep body functions operating. With the very unusual warm up we had over the course of several days last week, coupled with wind and rains, we saw much of the snow throughout the Muskegon river watershed melt, runoff into the river and bring river levels up. Click HERE for current Muskegon river water data for the Croton, Michigan area. This is exactly why mid winter is the time for some trade shows, destination fishing trips to warmer regions and putting in time at the fly tying vise to concoct next seasons creations, just to name a few. Others venture onto the ice in search of Bluegill, Perch, Walleye and Pike to keep their fishy needs satisfied ! With a long range forecast calling for more snow, the return of some colder weather and with no signs of another crazy 50 degree warm up in the middle of winter, we should see more typical mid winter weather through the end of February. Click HERE for current weather information and forecast for the Muskegon, Michigan area. 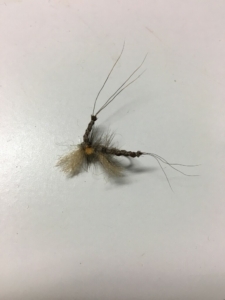 Much of my time recently has been spent tying flies, getting some snow man making and down hill skiing in with my sons and wife and getting ready for the upcoming spring steelhead, early summer trout and mid/late summer Smallmouth bass and Pike fishing. Should conditions allow for it in the next few weeks, I hope to get back on the river for either some Steelhead or resident Brown and Rainbow trout fishing on the Muskegon river, but I’m a realist and wouldn’t head out expecting very good results with present water conditions, which are high and cold. Normal flows for this time of winter are in the 2,000 cfs range, the river is presently running about 3,000 cfs and with water temperatures bouncing around the 33-33.5 degree mark…..brrrrr !